Barbed Staple, square shank, cut point, galvanized. Barbed Staple, square shank, cut point, copper coated. Cut Point Staple, copper coated, 1-1/2" long x 1/4" inside width x .148" diameter wire. Used to secure ground wire and ground wire molding to wood poles. Diamond Point Staple, copper coated, 1" long x 1/4" inside width x .114" diameter wire. Used to secure ground wire and ground wire molding to wood poles. Diamond Point Staple, hot dip galvanized, 1" long x 5/16" inside width x .12" diameter wire. Used to secure ground wire and ground wire molding to wood poles. 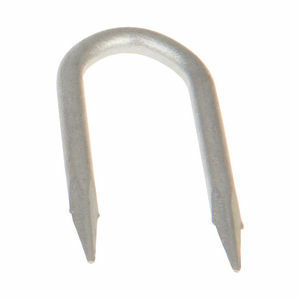 Diamond Point Staple, electro zinc plated, 1" long x 5/16" inside width x .12" diameter wire. Used to secure ground wire and ground wire molding to wood poles. Cut Point Staple, copper coated, 1-1/4" long x 3/16" inside width x .114" diameter wire. Used to secure ground wire and ground wire molding to wood poles. Diamond Point Staple, copper coated, 1-1/4" long x 1/4" inside width x .114" diameter wire. Used to secure ground wire and ground wire molding to wood poles. Cut Point Staple, copper coated, 1-3/8" long x 1/2" inside width x .162" diameter wire. Used to secure ground wire and ground wire molding to wood poles. 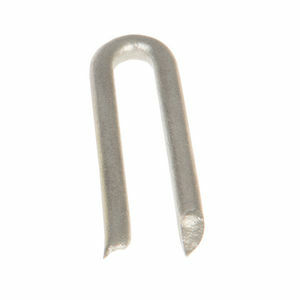 Diamond Point Staple, electro zinc plated, 1-1/2" long x 1/4" inside width x .148" diameter wire. Used to secure ground wire and ground wire molding to wood poles. Diamond Point Staple, copper coated, 1-1/2" long x 5/16" inside width x .144" diameter wire. Used to secure ground wire and ground wire molding to wood poles. Cut Point Staple, copper coated, 1-1/2" long x 3/8" inside width x .162" diameter wire. Used to secure ground wire and ground wire molding to wood poles. RUS Listed. Diamond Point Staple, hot dip galvanized, 1-1/2" long x 3/8" inside width x .148" diameter wire. Used to secure ground wire and ground wire molding to wood poles. Diamond Point Staple, copper coated, 1-3/4" long x 3/8" inside width x .144" diameter wire. Used to secure ground wire and ground wire molding to wood poles. Diamond Point Staple, hot dip galvanized, 1-3/4" long x 3/8" inside width x .148" diameter wire. Used to secure ground wire and ground wire molding to wood poles. 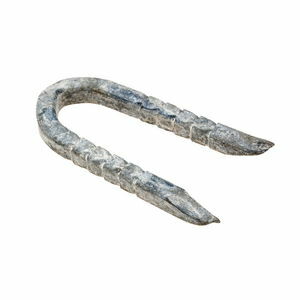 Diamond Point Staple, electro zinc plated, 1-3/4" long x 3/8" inside width x .148" diameter wire. Used to secure ground wire and ground wire molding to wood poles. Diamond Point Staple, electro zinc plated, 2" long x 1/2" inside width x .162" diameter wire. Used to secure ground wire and ground wire molding to wood poles. Diamond Point Staple, hot dip galvanized, 2" long x 1/2" inside width x .162" diameter wire. Used to secure ground wire and ground wire molding to wood poles. RUS Listed. Cut Point Staple, copper coated, 2" long x 1/2" inside width x .162" diameter wire. Used to secure ground wire and ground wire molding to wood poles. RUS Listed. Diamond Point Staple, copper coated, 2" long x 1/2" inside width x .162" diameter wire. Used to secure ground wire and ground wire molding to wood poles. Diamond Point Staple, copper coated, 2" long x 5/8" inside width x .162" diameter wire. Used to secure ground wire and ground wire molding to wood poles. Diamond Point Staple, electro zinc plated, 2" long x 5/8" inside width x .162" diameter wire. Used to secure ground wire and ground wire molding to wood poles. Diamond Point Staple, hot dip galvanized, 2" long x 5/8" inside width x .162" diameter wire. Used to secure ground wire and ground wire molding to wood poles. Diamond Point Staple, electro zinc plated, 2" long x 5/8" inside width x .188" diameter wire. Used to secure ground wire and ground wire molding to wood poles.